More things to consider for UHD users. August 2nd Update: We've reviewed the 2TB Xbox One S (see here) and gone deeper into the Ultra HD Blu-ray and 4K video streaming experience (see here). Ever since Microsoft unveiled the Xbox One S publically at the Xbox E3 2016 briefing, there have been questions regarding the system's UHD support. (See here.) With the new system tantalizing close to being in High-Def Digest hands, finding out how the system stacks up against both the original Xbox One and UHD HDR components like the Samsung UBD-K8500 is closer than ever. For now, however, we do have the go-ahead to share some important answers that should intrigue those of among us who are early adopters of home theater tech. While it may seem like a given considering that the system supports Ultra HD Disc playback, we can confirm that the Xbox One S will support HDR10. 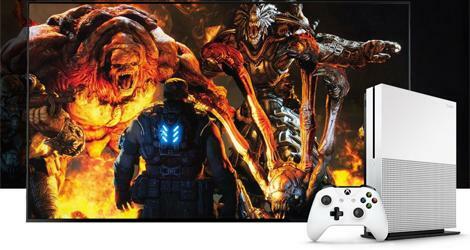 When asked about HDR10 and Dolby Vision support, a Microsoft Spokesperson responded, "The Xbox One S support HDR10 standards." The current Xbox One does not support direct bitstreaming for audio formats. This limitation prevents users from enjoying the object-based audio formats, Dolby Atmos and DTS:X. For now, it seems that the Ultra HD Blu-ray playback of the Xbox One S will carry with it a similar limitation. When asked if the Xbox One S support direct bitstreaming, Atmos, and DTS:X, a Microsoft Spokesperson responded, "Support for Dolby Atmos, Direct Bitstreaming and DTS:X is something the team is exploring but we don’t have anything to share just yet." It's worth pointing out that I don't know of any specific hardware limitation that prevents either the Xbox One of Xbox One S from supporting direct bitstreaming. (And yes, direct bitstreaming was a feature that came with the PS3 slim.) While Atmos tracks on Blu-Rays and Ultra HD Blu-rays have blossomed in number over the past 18 months, we're still less than two years from the format's Blu-ray introduction. Currently, DTS:X is only available on a handful of discs and AVRs, but that will change in the coming months. If Microsoft could come through on Atmos and DTS:X support in the next few months, it would be greatly appreciated. A timeline and intention to support those formats could be given at any time, and ought to alleviate some of the frustration surrounding this issue. Along these same lines of the Xbox One S media capabilities, Microsoft has nothing new to share with regards to a new Microsoft-produced media remote. "As far as a new media remote, we’re always looking for ways to create the best experience for fans but haven’t announced anything to date." That leaves companies like PDP on the hook for creating a media remote to beat the 2014 Xbox One Media Remote. While these may not be the answers that I would have preferred, my current feeling about the Xbox One S beyond an overall new tech anticipation is a desire to see its HDR gaming capabilities put to work. We are looking at a TV environment where HDR will be in all models, or at least in all 4K models. Having HDR as a console feature could prove to be a consideration before too long.